This article pertains to customers who connect to Chili Piper via Office365 Registered Application. When initializing the connect, the Microsoft Admin will be prompted to accept the permission scope. Why is this required? To determine your default time zone. Read and write to your and shared calendars - Allows the app to read, update, create, and delete events in all calendars in your organization you have permissions to access. This includes delegate and shared calendars. Why is this required? To allow users to schedule meetings with themselves and others in your organization. Sign you in and read your profile - Allows you to sign in to the app with your organizational account and let the app read your profile. It also allows the app to read basic company information. Why is this required? Allows the admin and the users you add to sign into the app via Registered Application. Have Full Access to your calendars - Allows the app to read, write, update, create, and delete events in your calendars. Why is this required? Pertains to the users you add to the account. This scope allows Chili Piper to schedule meetings, reschedule meetings, and cancel meetings. Sign in as you - Allows you to sign in to the app with your work or school account and allows the app to read your basic profile information. Why is this required? To allow users to sign in. 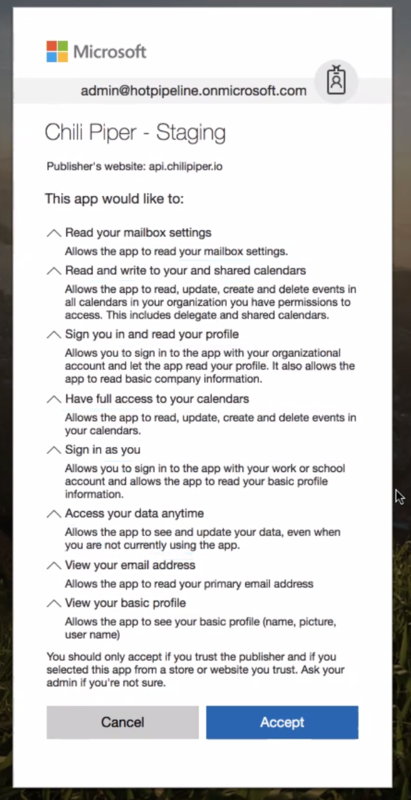 Access your Data anytime - Allows the app to see and update your data, even when you are not currently using the app. Why is this required? To have access to calendar availability and schedule meetings on behalf of reps if they are not currently logged in. Ex: outside of working hours. Why is this required? To schedule meetings on user's behalf and send meeting notifications. Why is this required? To create the profile of the user in the Chili Piper app.